Union awarded among the 500 most important and reliable companies in Italy out of a total of 4.500.000 operating companies in all the national territory!! Our attention to the solidity of our company and the constant investments are responsibilities we feel towards those who buy our machines. Our success over time is the first guarantee for our customers! First of all we want to thank our collaborators and share with them this award because they contribute with passion and dedication to the growth of our company in the world. We also thank all the customers who, since 1950, have given us confidence and have built our history!! 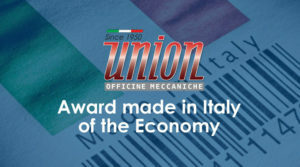 Union, which is situated in San Vittore Olona (Milano) and manufactures complete extrusion lines, is one of the best 500 SME which have continued to invest during the crisis and now are champions of the Made in Italy. This is what emerges from the study commissioned to ItalyPost by Economy – the economic insert of Il Corriere della Sera – to celebrate its first year of life. The study, presented at the Milan Stock Exchange on the 22nd of March, is based on the analysis of about 15.000 financial statements. The study has been carried out by a group of financial analysts of the rating agency ModeFrance and by some experts in corporate finance of Special Affairs and was based on a month-long travel in Italy. During this period 500 champions have been identified: companies which are the authors of the economic recovery thanks to a 22 billion turnover and more than 4 billion of gross income. These companies are growing more than 7% each year and have invested during the crisis. 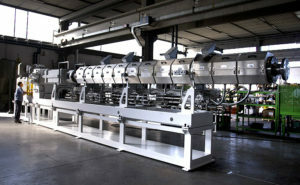 They have a turnover of around 20 – 120 billion of Euros and during the worse years of the economic crisis, i.e. between 2010 and 2016, instead of collapsing they have grown dramatically, producing profits and jobs. This study allows to look in the face one by one these companies – which are mostly unknown – and to understand the growth they had during the last six years and their profitability of the last three years. These companies represents the backbone of our country’s economy and they didn’t need the help of banks: in fact, in most cases, they have no debts but high liquidity ratio and high level of capitalization. These company have succeeded in coping with the crisis and have continued to invest taking advantage of spaces left free by others thanks to many factors: the particular attention given to the product, the improvement of the production processes and the technology used and the willingness of expanding abroad where they often hold a primary role in their field. These 500 champions do not form a single group because each of them stands out in its field. Anyway they have in common many characteristics: they are dynamic, excellent and they are Italian family owned companies for one or more generations. Sometimes the family owned company model may be considered as a limit but in this case it has outclassed old pre-crisis models. These 500 champions are growing because they do not care about stereotypes and fame : they are growing because they are constantly working investing, doing research and development and producing innovation.